With this adapter, you can connect Windows and Mac based Thunderbolt 3 computers to older Thunderbolt devices, such as external hard drives, Thunderbolt displays, and older Thunderbolt capable Mac computers. 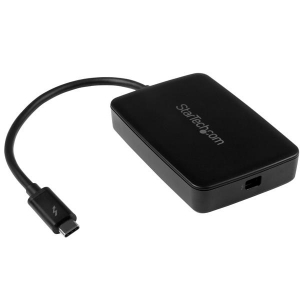 Because this adapter is backward compatible, you can connect to first-generation Thunderbolt devices at 10Gbps speed. With Thunderbolt 2 devices, you can connect at 20Gbps. 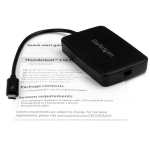 The adapter satisfies all requirements for bi-directional data transfers and simultaneous power for bus-powered devices. • Note: This adapter is compatible with Thunderbolt displays only. It will not work with Mini DisplayPort (mDP) or DisplayPort (DP) monitors. • This is an 'Active' adapter cable. Any host system that doesn’t provide the full 15W of bus power won’t work with this device. Consult the manufacturer of your host system to determine how much bus power your host system provides.